Adding a detail like a tray ceiling increases the feeling of spaciousness and adds architectural interest, as seen in this bedroom. They can make rooms feel smaller and more intimate or more expansive. Installing a barrel-vaulted ceiling in a bedroom or living room is an excellent way of giving the impression of greater space. 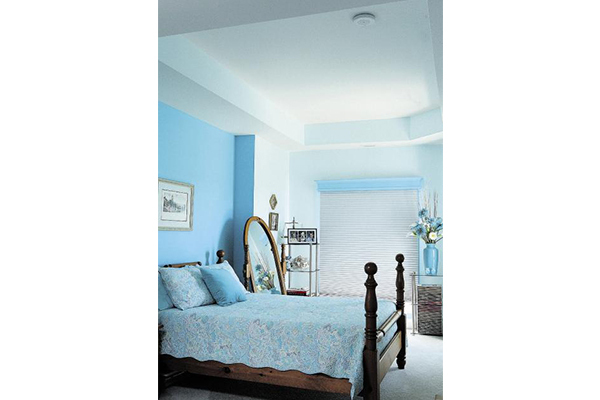 If you can't do this, create a similar effect by recessing part of the ceiling to form a tray ceiling. In addition to increasing the perception of height, this creates architectural interest and is often highlighted with built-in lighting. Depending on decor, more or fewer architectural details to the tray can contribute to your overall look. Key spaces for ceiling details or treatments are powder rooms, bedrooms and kitchens. For instance, a tray or other recessed ceiling treatment over your kitchen island can highlight this culinary focal point. Adding a cove to the ceiling-wall joint is another simple way of adding interest to a room and making it look more finished. When carefully applied, a cove ceiling draws the gaze to the perimeter of the room, giving a sense of increased space. Again, the level of complexity of the coving needs to be appropriate to the overall level of architectural complexity and plaster coving is definitely the way to go. Another ceiling treatment that can have lots of impact is a plaster medallion to highlight your chandelier. This, as well as other plaster detailing, can be off the shelf or custom made. Nevado Artistic Plaster (nevadoartisticplaster.ca) is a great source for high-quality plaster detailing. Remember, a small recessed detail with trim or a simple cove application can have a huge effect. If scaled to a significant size and elegantly executed in wood, baseboards can warm up your space. If your condo is modern, you might decide to pass on mouldings or at least use simple versions painted to match the walls. Although good baseboards can be expensive, they are worth it if well executed. If you are interested in luxurious custom mouldings, visit Mountain Moulding (mountainmoulding.com), renowned for its beautiful custom work that is preferred by some of the best architects and designers. Opening or closing a solid mahogany door will continue to delight you for years. Appropriately selected, doors can create a sense of warmth, character and security. To enhance space and reduce noise transfer without disrupting the visual line from room to room, consider French doors. These can be embellished with bevelled glass or etching if privacy is a concern. When contemplating which door to install, think solid. Also remember there is no end of possibilities for wood and French doors. The better the quality, the greater the user satisfaction. For starters, hinge quality should be matched to that of the doors. A poorly hung door will not feel right year after year. For an elegant touch, add finials to the hinges. These range in style from simple to ornate and should match the style of the condo's interior. Since you will be in contact with the handles or knobs, check these out carefully for feel and quality. A door knob that does not fit comfortably in your hand may not be the best option for your bathroom door, for instance, as this is an often-used space. While some fittings are very expensive, you may be able to find similar quality at lower cost if you shop around online. I really love some of the bathroom knobs from Waterworks (waterworks.com) and they also have superb plumbing fittings. Rocky Mountain Hardware (rockymountainhardware.com), while very expensive, offers an interesting selection of bronzerubbed handles. Try selecting one or two for a significant location or important door. This might be supported by a cast of cheaper - but similarly styled - knobs and pulls. When fitting your doors, do not ignore the knobs and pulls on your drawers and cupboards; these can contribute significantly to a condo's character and quality. Just remember that hardware makes a statement and, although subtle, it can be very effective. Glass and mirrors can be subtle or used as a statement. Both will increase the perceived size of your space. Glass doors or a glass wall can open up a small space and the reflective qualities of mirrors work wonders to create the illusion of a larger space. Think of different glass textures and match them to your requirements. Seed glass and antique mirrored finishes are stylish options, and antique finishes have the added benefit of coming in a variety of textures and qualities. Wall niches can be created with flat backs to showcase paintings or with curved backs to highlight sculptures. Subtle lighting should be used to show these architectural details to their best advantage and LED lighting is the most current. Foyers often have niches, pillars and columns to create a sense of importance. Nothing changes a space faster than lighting. It can create ambience from utilitarian (house cleaning, routine cooking, getting ready for work) to romantic (getting cosy with a book or relaxing in the bath). Multiple, lower-level sources of light are better than a few bright lights as this gives many more mood-creating options. However, this is not meant to rule out the judicious use of floor and table lamps. And every light deserves a dimmer. This will ensure the versatility of a space - from doing work to entertaining. Marilyn Wilson, owner of Marilyn Wilson Dream Properties Inc. Brokerage in Ottawa has been selling real estate for more than 24 years.